Nigeria has signed the Nuclear Weapons Prohibition Treaty, joining dozens of other countries that signed the treaty to ban nuclear weapons amid tensions over North Korea’s nuclear and missile tests. The Minister of Foreign Affairs, Geoffrey Onyeama, signed the treaty on behalf of Nigeria on Wednesday at the UN headquarters on the sidelines of the High-level UN General Assembly. After the signing ceremony, Onyeama told correspondent of the News Agency of Nigeria (NAN) that Nigeria was in support of the weapons-free world. He said “right from the early 60s, Nigeria has been a strong advocate of nuclear weapons prohibition and non-proliferation of nuclear weapons. “You may recall in the early 60s when France tested an atom bomb-related device in the Sahara and Nigeria cut diplomatic relations with France at the time. The minister said it was unfortunate that countries with nuclear weapons saw them as deterrence and safeguarded their security. According to him, it will take great effort to really push and get a larger number of countries to accede to the treaty, especially nuclear weapons states. He urged countries that signed the treaty, Civil Society Organisations and intergovernmental organisations to convince others to accede to the treaty. The treaty would enter into force 90 days after 50 countries ratified it, while Nigeria was due to deposit its ratification soon. 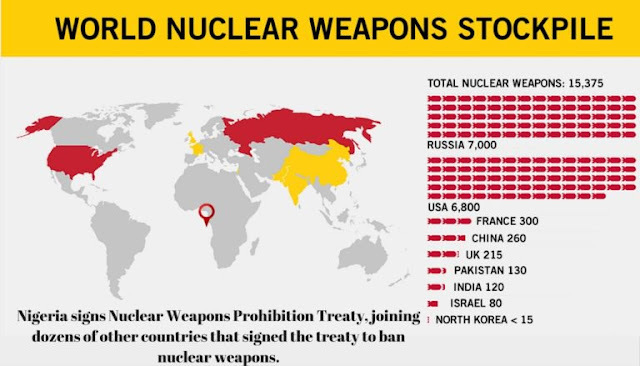 The UN had in July adopted Nuclear Weapons Prohibition Treaty in a majority vote by 122 countries, leading toward total elimination of nuclear weapons, while 60 countries boycotted. Nigeria, together with Ireland, Austria, Brazil, Mexico and South Africa played leadership roles in bringing forward the UN resolution convening the Diplomatic Conference that negotiated the ground-breaking treaty. Nigeria’s Permanent Representative to the UN, Prof. Tijjani Bande, said it was sad that “there were countries that still have nuclear weapons and refused to give them up”. Bande pointed out that resources spent in maintaining nuclear weapons could better be used in other development projects. According to him, those regions with nuclear weapons has continued to be unstable, citing India and Pakistan and Israel and their neighbours. UN Secretary-General Antonio Guterres said as he opened the treaty for signing “because there remain some 15,000 nuclear weapons in existence. U.S. President Donald Trump told the 193-member UN General Assembly on Tuesday that if threatened, the U.S. would “totally destroy” North Korea and its 26 million people. President Muhammadu Buhari, in his address to the UN, said the most pressing threat to international peace and security was accelerated nuclear weapons development programme by North Korea. Buhari, therefore, urged that necessary pressure and diplomatic efforts be brought to bear on North Korea to accept a peaceful resolution of the crisis. “Nigeria proposes a strong UN delegation to urgently engage the North Korean Leader. The delegation, led by the Security Council, should include members from all the regions,” Buhari said.